Mums, or chrysanthemums, provide late summer and fall color to the flower garden when other types of flowers have completed their blooming cycle. 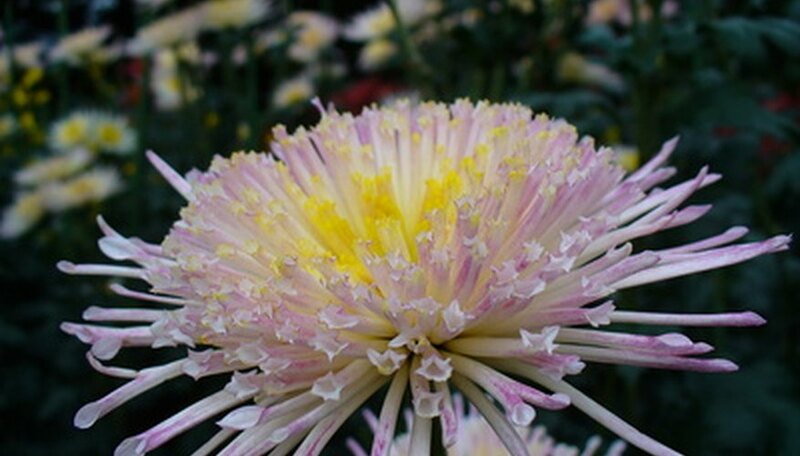 Available in both large and small flowering varieties, mums bloom in a variety of colors and flower shapes. Cold hardy varieties grow as perennials in the flower bed, while less cold tolerant mums must be dug up and potted each year or grown as annuals. Care requirements are the same for both types except for in winter. Water mums once weekly from spring until the first fall frost. Supply enough water to moisten the top 6 to 8 inches of soil at each irrigation, or the equivalent of 1 inch of rainfall. Spread a 2-inch layer of wood chips or another organic mulch around and between the mums. Mulch helps prevent water evaporation from the soil and also prevents some weed growth. Weed the mum bed once every one to two weeks, as mums do not tolerate weed competition. Cultivate the top 1 inch of soil with a handheld cultivator tool, but avoid cultivating too deeply as mums have shallow roots that are easily damaged. Pinch of the top 1/2 inch of each growing stem once the mums are 6 inches tall. Pinching encourages full, even growth and prevents the plants from becoming leggy. Stop pinching the plants in late June, otherwise you may remove flower buds. Install 1-foot tall stakes behind the flower stem of large-flowering varieties. Install stakes in spring so the foliage can grow around and camouflage the stake. Tie the flower stalk loosely to the stake once it is 6 to 8 inches tall. Fertilize mums once a month from the time growth begins in spring until the first flower buds appear. Apply 1 lb. of 5-10-5 or similar fertilizer to every 100 square feet of mum bed. Spread the fertilizer around the plants but do not get it directly on the foliage. Cover hardy mums with a 4- to 6-inch layer of leaf or straw mulch after the first hard freeze in fall to help protect them from winter cold. Dig up non-hardy mums and transplant them to a pot. Bring the pot indoors, and place it in a brightly lit area until spring. Mums are tolerant of most insect pests and are prone to few diseases. Mums prefer well-drained soil in beds that receive full sunlight.